A step up from the Grid Slammer, it's best in front of a singing valve amp. More EQ options and drive than the Grid Slammer. As Mesa/Boogie enters the stompbox market with a range of four overdrive/distortion stompboxes we take a look at the Flux-Drive, which offers mid-level gain with EQ control. We were as surprised as anyone to find out that Mesa/Boogie, bona fide guitar and bass amplifier legend, has decided to dip its tone-obsessed toe into the crowded waters of the pedal market. The guys from Petaluma have built pedals before - the valve-powered V-Twin, for example, has its own place in history - but releasing a quartet of 'normal' stompboxes into a saturated market? Well, with a 40-year-plus reputation for some of the most memorable distortion tones of all time, you might argue that saturation is exactly Mesa's business. "The Flux-Drive offers you more overdrive - though not tons more - and powerful control over bass and treble frequencies"
Each of the new pedals shares the same sturdy metal chassis into which is loaded its custom PCB-based innards. The pedals are a little taller than the 'standard' MXR-type box, and finished to impeccable standards. All the jacks and pots are securely screwed to the chassis, the only downside being the forever-annoying task of removing four screws to access the batteries. Like most of the range, the Flux-Drive specifies a 15mA current draw (slightly higher than many overdrives) - you get a good few hours off a nine- volter, or use an AC adaptor. 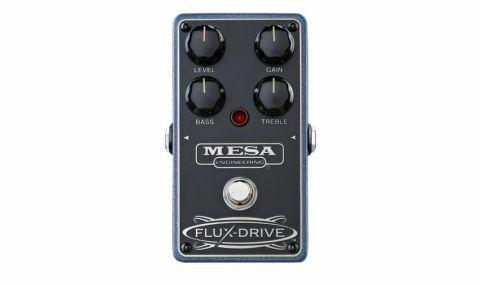 "Set to higher levels of gain, you step closer towards that compressed, fluid-type overdrive for which Mesa is famous"
Here, you have much more control of the EQ of the pedal - so it can sound similar to the Grid Slammer, but also radically different. The overdrive sits roughly in the rounded, 'blues' sphere (as opposed to a much more harsh-edged distortion), but set to higher levels of gain, you step closer towards that compressed, fluid-type overdrive for which Mesa is famous. Metal it ain't, though. Humbuckers are better served here than with the Grid Slammer in our opinion, simply because of the extended EQ control. It really does pay to experiment with the bass and treble pots, enabling more harmonically packed tones, or more cutting, strident attack. If you like your gain full and singing, with your guitar's voice still detectable, you'll like this.